The church may be C12 in its origins, but was largely reconstructed in the C19. In the early C20 a popular excursion for visitors to Hastings was to the ‘church in the woods’ at Hollington. It was picturesquely situated and also popular for burials, as many large memorials in the churchyard show. At an earlier date it is said to have been used for clandestine marriages (Lower I p235). It remained isolated until the early 1970s, as the first 1:50,000 edition of the Ordnance Survey map shows, but new housing and roads have left the church down a short lane in the remnants of the wood. The original dedication was probably to St Rumbold (VCH 9 p86) and the present one stems from confusion with a chapel of St Leonard in the southern part of the parish, from which the name of the resort of St Leonards derives ultimately. Only fragments of the present church predate the C19, but the Sharpe Collection drawing (1797) and that by Adelaide Tracy (before 1857) (IV p83) suggest it was like other small churches in this area. The former shows a round-headed south nave window, which looks C12, with a single lancet and a doorway in the chancel, suggesting this was added or extended in the C13. A plain, pointed north doorway in the nave could also be C13 which would show there were alterations here also. Nibbs’s etching of 1860 (in his 1874 volume) shows the west wall as today, with a large buttress and without a window, and the belfry with a sloping west side. He also shows a large south porch with a tile-hung gable, which was probably post-Reformation, and some C15 looking square-headed windows to the south. When Sir Stephen Glynne visited (date unknown) there was no chancel arch (SNQ 16 (Nov 1966) p268) and there is no reason to believe there had ever been one. The belfry is now tiled, instead of the previous weather-boarding and the massive supporting cage inside is C19. Assuming this follows its predecessor, this could have been C14 or C15; one nave roof-timber may remain from then and would accord with the blocked cinquefoiled window in the chancel and the south windows shown by Nibbs; two square-headed north ones in the nave are now only visible inside. 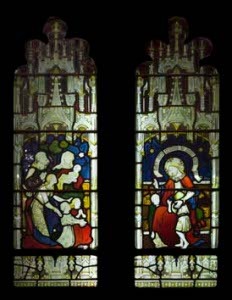 The Sharpe drawing shows other windows that were post-Reformation. 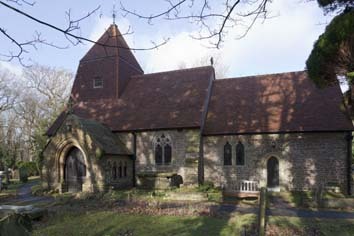 The church was mostly rebuilt in 1865, faced in an unattractive dark brown stone. 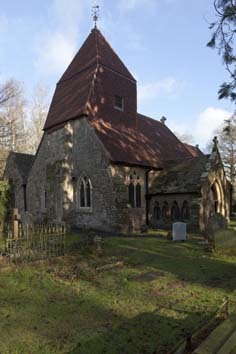 Obeisance to its past included the pair of south lancets of the chancel and the form of the roof and belfry. An inappropriately elaborate chancel arch was inserted, with a traceried east window and south windows in the nave with rather individual Decorated tracery. The most prominent new feature outside is the south porch with open stone side-arcades. The identity of the architect is not straightforward. A contemporary account in Building News (13 p227) assigns the work to W Slater and R H Carpenter, but features like the south porch and the retention of the bellcote do not look like their work. H Carpenter of Hastings is more likely, especially as he has also been confused with R H Carpenter elsewhere. The dark interior is wholly C19 and all memorials had been removed by 1869, presumably in 1865 (1 p146). In 1964 and the following years repairs were carried out by C F Callow and R E Burstow (ICBS) and the church seems to have prospered since in its modern setting. 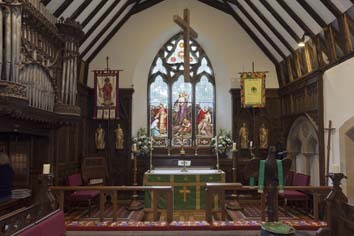 A sign of this is the large parish room of 1977, north of the nave. Font: Octagonal C19 and probably by the architect. One was intended in 1865 (BN 13 p227), in place of one said to have had five sides (Bond p57). 1. 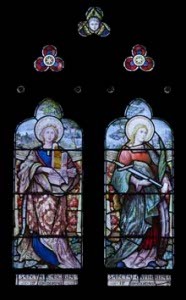 (East window) J B Capronnier 1873 (signed); it shows his characteristic pictorial style and his liking for vivid colours. 2. 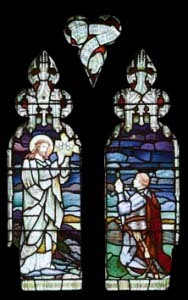 (West window, to south) Heaton, Butler and Bayne, 1922 (www.stainedglassrecords.org retrieved on 11/3/2013). 3. (Elsewhere) Clayton and Bell, 1862-86 (BN 13 ibid). The glass in the nave north windows is now lit artificially because of the new building outside. Musical instruments: (Vestry) Formerly used to accompany the services. 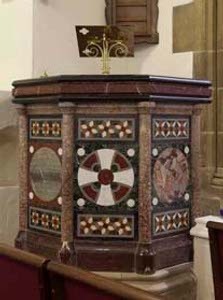 Pulpit: Inlaid marble, mostly in various shades of reddish brown. Designed by the architect (i e whichever Carpenter it was), 1865 (ibid). Reredos and panelling: 1890, carved by J Forsyth (BE(E) p470).